Heat oil in the pan and put chicken in it. Fry Chicken till golden brown. Now take out chicken from the oil and put it aside. Now take out half oil from the pan and add ginger garlic paste and tomatotes to it. Cover it till tomatoes softens. 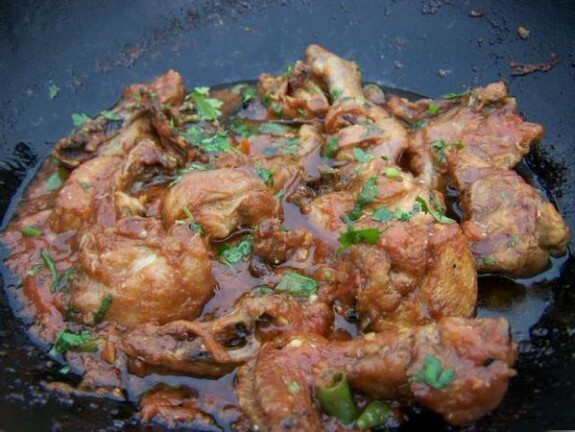 Then add garam masala or you can add 2tbsp karahi masala as well,salt and fried chicken to it. Cover and cook till chicken tenders. In the end add green chillies and garlic. Cover just for 5 minutes. Its ready to serve.